I think PSHE is vital in schools and making it compulsory would be great as it would give the subject the same importance as other subjects, which in turn would help with timetabling, staff allocation, budget and inset. My only concern is that if it is compulsory, who makes the decision on what should be covered ? 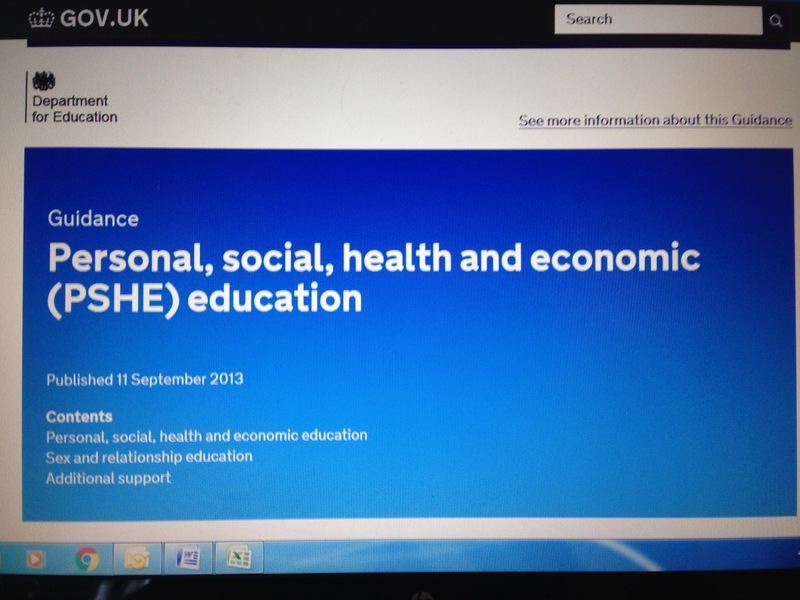 To help explain this, lets look at what is happening with all the other subjects that the DfE involve themselves in. I teach Design and Technology ( and Engineering). We are one of the few subjects who still don’t have our A level syllabus sorted for when we go linear. The exam boards and DfE have had their input, so have Universities and some teachers have made their opinion ( although I am not sure it has been heard), but no one can agree on what the syllabus should look like. Last I looked Trigonometry was included ALOT, to make it more like an academic subject ( don’t get me started). So you can see my concern with PSHE. Obviously there won’t be an exam ( !) so does that mean that DfE will decided the topics. Now this really worries me. I know its different for every school but at the moment my Head of PSHE has worked tirelessly to get a team of teachers who want to teach PSHE and teach topics that they feel comfortable with. There are challenging topics that we as a school think should be covered, but there are also topics that the pupils have asked to be included. At the end of each topic the pupils complete a survey and let us know what they thought of the topic and what they wanted to know. This has been so successful that PSHE isn’t seen as a fill in, it is seen as a vital part of the pastoral support in the school. Staff enjoy teaching the lessons and pupils like the fact that they have input into what they learn. They also are wise enough to know that some topics will be covered over a period of time. Esafety lesson for example are very different at 11 years old than they are at 16. Here are the topics we cover at the moment, those in bold are the ones the student requested. I am sure that every school is different and cover contrasting topics. But I really feel uncomfortable being told what to cover and when, by people who have not taught these challenging topics to children. FGM for example has been encouraged to be discussed with 10 years old, but many schools have found that it fits in better at stages throughout the child school life. Introducing it at 10 but then going into more detail at 12. This is a perfect example that if PSHE becomes a list of topics that just have to be covered as quickly as possible, it won’t be educational and it won’t help the students. PSHE is too important to be a tick in a box and this is why I am slightly concerned about what complusary PSHE will mean.